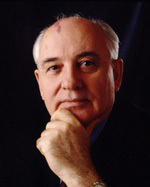 MIKHAIL GORBACHEV, born in 1931, was General Secretary of the Communist Party of the USSR from 1985 to 1991. As head of state he introduced the radical turnaround of his country's foreign and internal policies which led to a complete transformation of the Eastern Bloc and Europe. He was awarded the Nobel Peace Prize in 1990, and in 1991 resigned as Head of State. He became President of the Gorbachev Foundation in 1992, and since 1993 he has been Chairman of Green Cross International. Mikhail Gorbachev also chairs the United Russian Social Democratic Party, established in March 2000. He is the recipient of numerous awards and the author of many publications including Memoirs and On My Country and the World.